The United Kingdom joins what will become the European Union. 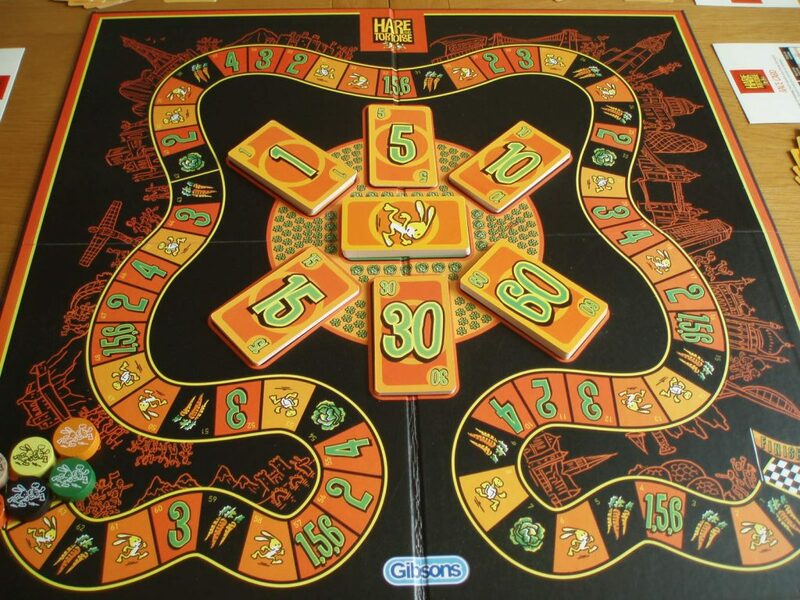 In the same year an unassuming board game called Hare and Tortoise is designed. 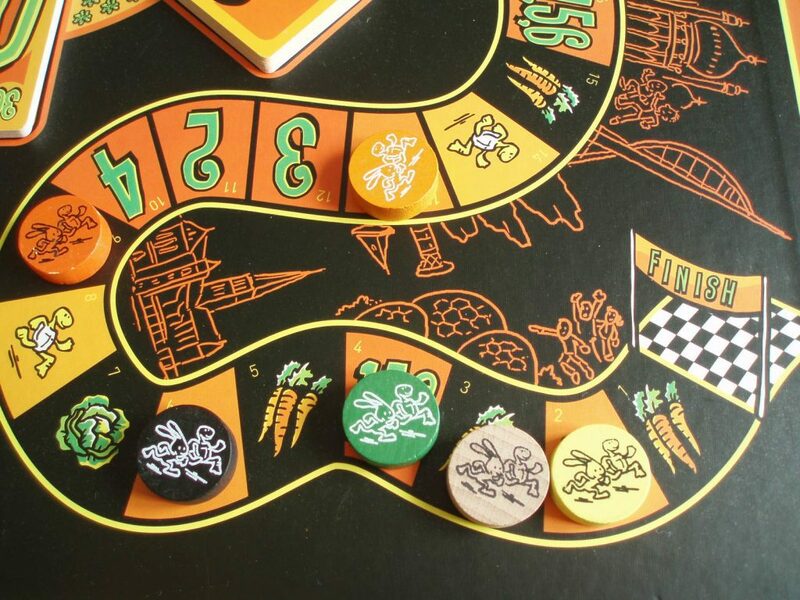 Hare and Tortoise is a racing game of carrot economics (the designer David Parlett’s term). Players enact both roles in Aesop’s tale, balancing long strides forward with tentative steps and even retreats. Carrots let you advance but the cost rockets with each additional space moved in a turn, making leaping ahead expensive indeed. The spaces on the track itself offer different mechanisms to replenish your carrot supply, from betting on your race position at the start of your next turn to taking hare cards that may improve or deplete your carrot reserves. The race track of Hare and Tortoise with the 5 different space types. Individually these may not seem all that exciting but combined they build so that each turn is a squirming puzzle over how far you can afford to travel and what you might get in return. Add in the requirement to drop off lettuces at a limited number of specific spaces, the ability to go backwards to earn large amounts of carrots, and the fact that you can never share a space with another player and suddenly what seems like a simple game of edging forward at a stately pace becomes tense; twitching and jittery like a rabbit with a caffeine addition. And then there’s the final sting in the fluffy white tail: you can only finish with a small number of carrots in your hand. As the game draws to a close you’re balancing the need for carrots to reach the finishing line against the requirement for almost no carrots to actually cross it. 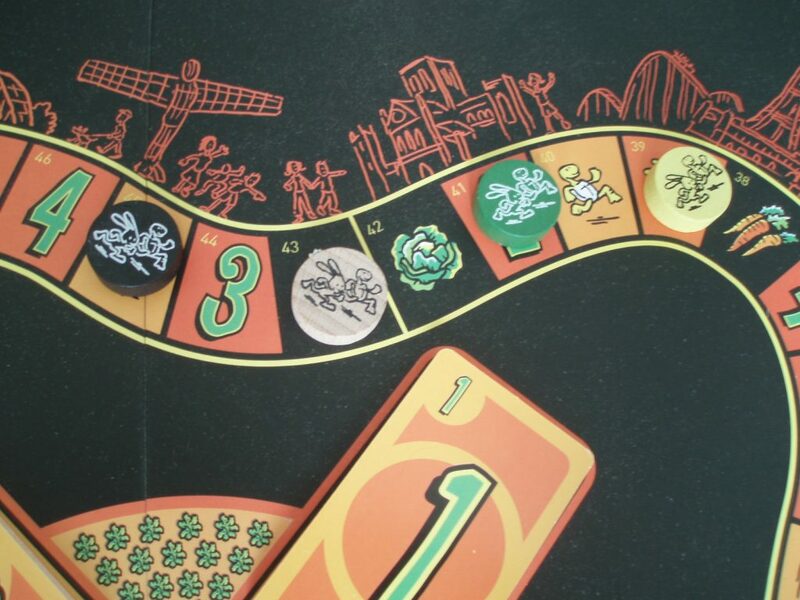 The game box claims: ‘Hare and Tortoise – the most ingenious race game ever devised’. Ingenious is one word. Diabolical is another. Kate Bush releases Wuthering Heights, launching one of the most beguiling careers in pop history. In the same year Hare and Tortoise is published in Germany, making it eligible for the first Spiel des Jahres prize. Hare and Tortoise feels small. It’s not a grand or showy game. The board is compact, the pieces functional and the design is restrained. It doesn’t scream excitement. And yet once it’s on the table, potential blossoms. The prospects of the path ahead and behind dominate your thoughts so completely that it takes time to notice the illustrations alongside the track tracing the journey past Loch Ness, the Angel of the North, the landmarks of London and down to Land’s End. It’s a game that doesn’t need to sing and dance for your attention, it has a quiet confidence that simply states Trust me, I know what I’m doing. The Angel of the North is one of the many UK landmarks that are dotted along the course. We live in a golden age of board games, with 1995’s Settlers of Catan often cited as the instigator of this cardboard tsunami. Yet arguably Hare and Tortoise is the true epicentre, a template for what was to come – thoughtful, intelligent and fun gaming for all ages. All more than 20 years before Catan settled in town. Hare & Tortoise wins the inaugural Spiel des Jahres. In the same year President Carter shoos a swimming swamp hare away from his fishing boat. The incident is later reported as ‘Paws attack’ by the press as a re-themed dig at an ineffectual president. Re-theming is a common pastime for Hare and Tortoise. Multiple editions with various tweaks to the theme, rules and design have emerged over the last 40 years. The first German release was re-themed as Hare and Hedgehog, a reference to a typically grim Grimm story that results in the hare’s demise – not quite in keeping with the tone of game itself. The most recent is 2016’s Around the World in 80 Days, with money and rumours replacing carrots and lettuces. Games with mechanics as strong as this stick around and I’m looking forward to the day when ‘Hummingbird and Crane’ enters the market – a Native American equivalent of Aesop’s The Tortoise and The Hare. The carrot cards and mysterious compost heap. Such restless reinvention highlights the tenuous link between theme and mechanics. For instance, are the lettuces eaten or discarded to the compost heap? And if they’re eaten (as would be thematically appropriate given the animals involved) then what’s the compost heap in the centre of the board for? Nowhere in the almost overly informal single rules sheet is it even mentioned. Understand that this is really a very well dressed abstract race game, the players stuttering their way to the finishing line and the titular animals more metaphorical than literal. Yet, in writing what might appear to be a criticism I found myself wondering whether a racing game really needs much theme anyway? On the strength of Hare and Tortoise I’d say no – if the mechanics are good enough then all that really matters is the path to the finishing line and your competitors jostling alongside you. And the mechanics of Hare and Tortoise are world-class. The global population reaches 7 billion, the date of this landmark officially designated by the UNFPA as the 31st October. Around the same time a new couple purchase a board game called Hare and Tortoise. Hare and Tortoise was the first board game that my wife and I bought together. We found it in Toys R Us in Warrington, England, across the road from where we’d earlier been on our first Ikea trip as a couple. Two milestone moments in one autumnal evening. 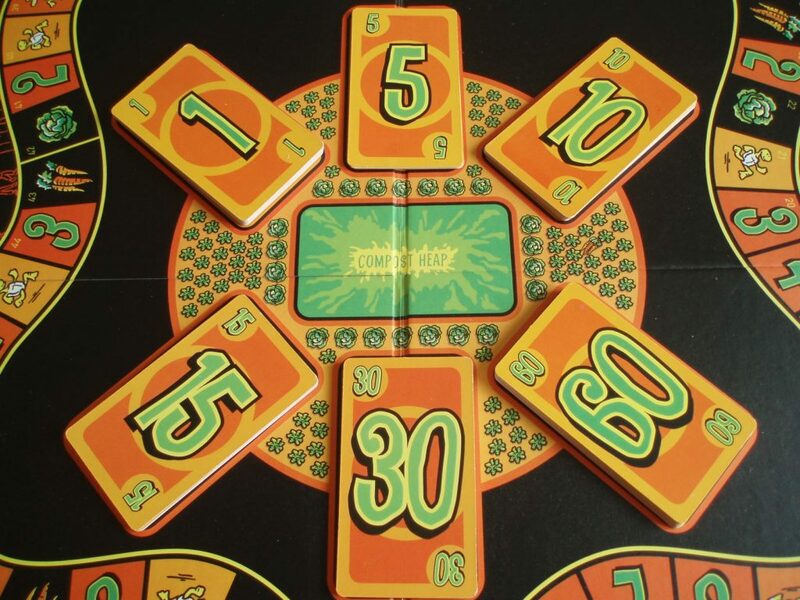 The discrete black and orange box of Hare and Tortoise stood out from a garish background of plastic toy-games like Buckaroo and Pop-up Pirate. It seemed to fall off the shelf into our hands. A game box that feels mature. I’m not too sure it was the best choice for two players (even if it is more thematic). The two player rules work, adding an extra dimension to your decisions with two pieces each, but Hare and Tortoise really shines at 4 or more. Yet downtime can be an issue at higher player counts. In theory turns are simple and quick but deep thinkers could be pondering for a while. Time spent counting spaces and carrots combined with the several ways you can miss a turn can elongate the gaps between meaningful moves like a hare stretching after a nap. Even so, there’s plenty to think about in the pauses. When you’re behind there’s an urge to binge on carrots to catch up. When you’re ahead you’re often broke, puzzling over the best options for resupplying. 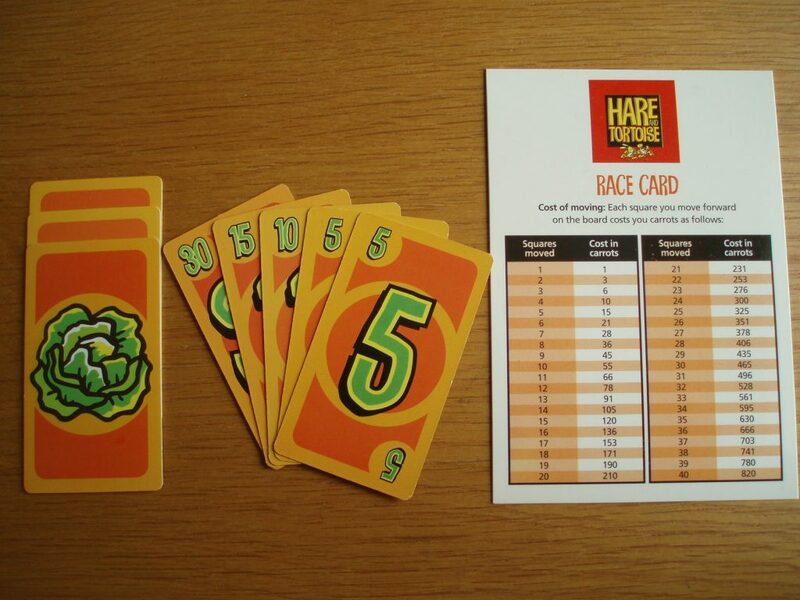 Race games are always interactive – you constantly care where your opponents are – but Hare and Tortoise adds to this with the ‘race placement’ spaces that give you extra carrots for starting the next turn in a certain position. You’re simultaneously betting on the positions of your opponents for your own gains whilst trying to scupper their own gambles. It’s a background hum of interactivity that keeps you interested in your opponents’ business throughout. Hare and Tortoise’s designer David Parlett wins the Göttinger Spatz award for a “lifetime’s dedication to games”. In the same year the US and UK branches of Toys R Us close. Independent toy and game shops might rejoice but the news about Toys R Us made me quietly sad. The staff have lost their jobs and it’s yet another empty lot in the retail park. My son will never feel that surge of excitement on seeing an illuminated giraffe through a car window. For all the gains of the digital age, for all the advances it’s brought, I feel as if we’re constantly taking small steps back as well. Your starting hand: 3 lettuces, 60 carrots and the table that you will spend a lot of time looking at to find out how many spaces your carrots will take you. I’ll admit that it’s hard sometimes to return to Hare and Tortoise. Time is limited and other, newer games shout more loudly from the shelf. The subtle pleasures of Hare and Tortoise are easily overlooked. It doesn’t have asymmetric player powers, a variable set up, legacy mechanics, exquisite artwork or any of the elements that are frequently praised in its descendants. Yet this is my failing, not the game’s – it doesn’t need them. I should look back more often, for when I do I remember just how exciting a game of Hare and Tortoise can be. It’s a tense, brain-burning scamper to the finish line. It’s a tricky balancing act of managing a single currency, a currency that you don’t want at the end of the game but that you need throughout like oxygen. It’s ridiculously quick and easy to explain but it’s tricky to master. Everything you need is in your hand of carrot cards but everything that interests you is what your opponents are doing. It may not have the obvious colour, character or combat of a race game like Jamaica but the purity of its underlying mechanical skeleton makes it that much more satisfying when you win. Hare and Tortoise enters the New Year with its first Chinese-language edition in print, published by Broadway Games. A few months later the United Kingdom is set to leave the EU. Progression is a jagged line. Time will tell whether the UK’s departure from the EU is an advancement or a retreat. In a surprising turnaround Kate Bush recently performed a series of shows for the first time since the live dates supporting her debut four decades ago. President Carter is now regarded as one of the most successful former-presidents for his peacekeeping and humanitarian efforts. Like the player pieces in Hare and Tortoise we stutter along, the peaks and valleys of progress smoothed out across the long run. The sting in the fluffy white tail – the tricky finish awaits. But the long run misses out the details and the context of the past helps us to understand the present. 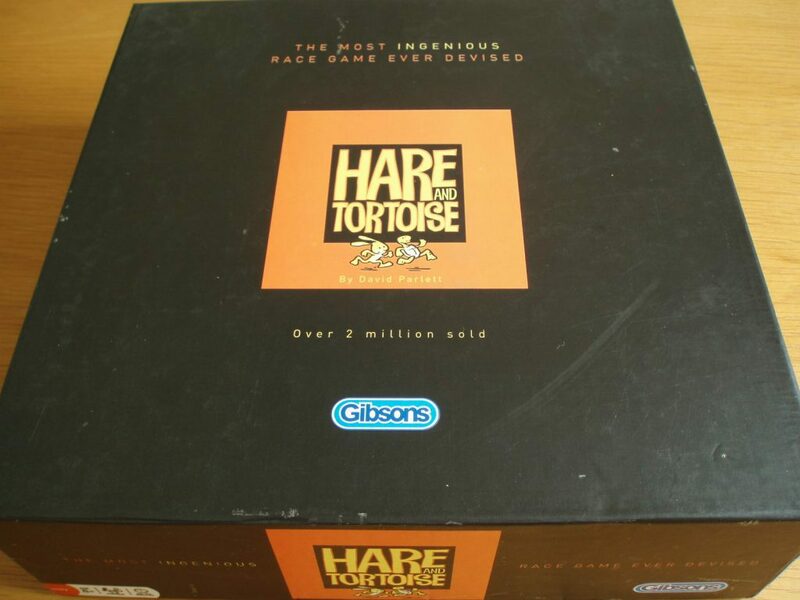 Hare and Tortoise is most commonly associated with 1979, the year it won the first Spiel des Jahres prize. Yet its heritage is a decade older, stemming from an unpublished 1969 design themed around the space race, perhaps the clearest example of our stammering progression as a species. The year Hare and Tortoise first hit the shelves (1974 in the UK) humanity discovered landmarks of its ancestral and cultural past with the findings of the hominid ‘Lucy’ and the Terracotta Army. Gaming, too, owes a debt to Hare and Tortoise’s release year – Rubik invented his cube (another Spiel des Jahres winner) and Dungeons & Dragons was first published. It may not have the same level of fame but Hare and Tortoise is worthy to sit alongside such esteemed alumni. Board games have come a long way over the years; new games are released all the time to a swell of excitement but only a few last the distance. Many past greats yearn for us to step back to them, and reward us richly when we do so. That Hare and Tortoise remains in print today, and is still so well regarded speaks volumes for just how strong it is. It’s significance as a cultural landmark make Hare and Tortoise worth knowing about, but the fact that it’s still a great game provides an incentive to try it beyond the historical. It’s easy to get swept up in the future, to focus on the new and novel but sometimes to go forwards it helps to go back. Hare and Tortoise taught me that. Publishers: 999 Games, ABACUSSPIELE, Alga, Broadway Toys LTD, danspil, Devir, Educa Sallent SA, Gibsons, Hobby Base, Intellect Games, John Sands Pty Ltd, K.E.Leg, Novoplast, Otto Maier Verlag, Ravensburger Spieleverlag GmbH, Rio Grande Games, Waddington's Games, Inc.